The story of a Magical Genius. In a collaborative effort with writer, publisher Mike Caveney Rauscher turned over a manuscript complete with vast amounts of photos, articles and accounts of LeRoy, Talma and Bosco. The book focuses on the life and career of Servais LeRoy. Based on insight gained from Rauscher's long friendship with LeRoy's chief assistant Elizabeth Ford, LeRoy's previously unpublished papers were originally printed as a monograph including insights from Elizabeth Ford sister of LeRoy's wife Talma. 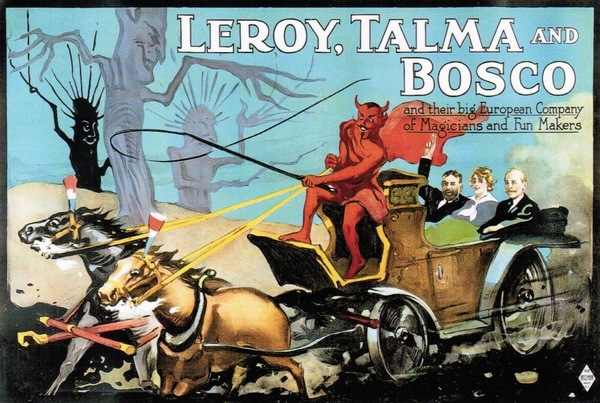 For onwards of forty years Rauscher gathered information about LeRoy, kept files, reproduced photos and gave lectures about the LeRoy, Talma and Bosco -Worlds Monarchs of Magic show. In his youth Rauscher lived near Keansburg , New Jersey, where LeRoy lived and died. This book is an in-depth portrait of one of magic's greatest performers and inventors. This is the story of a GREAT MAGICIAN, his rise to international fame and finally his catastrophic final performance and heartbreaking demise. 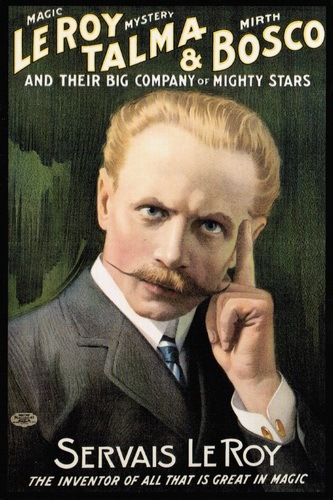 The book measurer 9 by 11-1/2 inches, contains 28 beautiful lithograph posters reproduced in full color, over 150 rare photos and drawings and is protected by a beautiful color dust jacket showing a lithograph portrait of LeRoy.